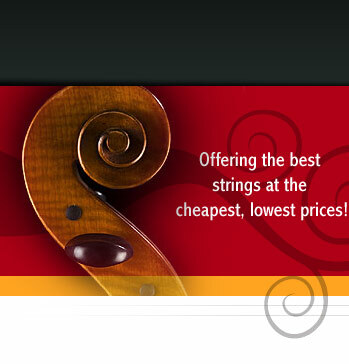 Passione cello strings are really starting to emerge as the 'new set to try' in recent months. We get a lot of calls and questions regarding what these are and whether or not they will be 'the strings' for your cello. The Passione C and G have a gut core (with ball end) where the A and D strings have the metal core with the ball end. What's different about these and how would they be better for your cello? These strings work well on all cellos, but here are some comparisons that will help you make up your mind on whether or not they would be good for you: First, if you have one of those 'tight' A strings that plays ok, but doesn't blend in or respond as easy as the rest of the lower 3 strings, definitely try the Passione A string. The Passiones have a very slight thinner gauge (you will not notice that) but it is enough to make the A sing easier. Some of our customers' experiences: The classic example is using a regular medium Larsen A string. While it sounded fine, it was harder in response. Switching to the A Passione was warmer and gave just enough of that quick response to balance in with the rest of the set. Every cello is different. Newer cellos often tend to play stiffer the first couple of years. What does that mean and how do they actually "play in"? Remember that the top (as well as the back) is carved wood. For anyone that has played baseball with a new baseball mitt, you know what "new" feels like. Once the fibers get used to creasing, bending and flexing, it becomes easier to use and the areas that are being "worked" tend to have a memory and easy to flex over time and use. That new top which is flexing from left to right (rocking) gets quicker and easier to do that over time. There is very noticeable break in time that first year or two and this can continue for years, though it is not indefinite. Here is a good way to see the motion that your cello top makes while playing: While you are sitting down in playing posture, start to pull or pluck your cello C string. Don't let go of that string. Just pull it like you're going to let a nice big pizzicato (open string). As you do this, look towards the bass bar side f-hole and you will see how that top will flex from side to side while you are playing. The sound post placement acts as a fulcrum in this regard. You can also see how moving that post in a different position will change the angle or manner by which that top will rock. This is but one factor that is part of the overall (set up) equation of your cello sound and performance. 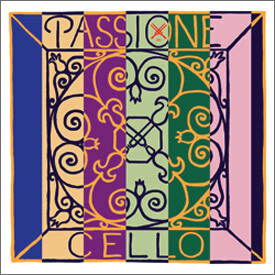 Back to the Cello Passiones. 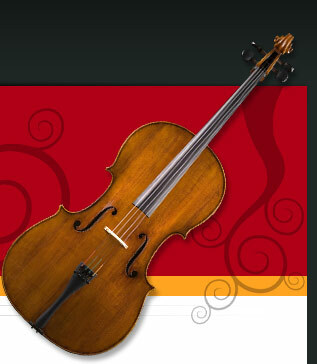 Whatever cello you may have, the Passione Cello strings will be slightly less tension than the regular steel cello set. These feel like steel and they all have steel wrapping.